Here’s a look at a couple interesting features that Cortana can do that you might not be away she can to. Cortana can roll the dice or flip a coin. Windows Phone 8.1 continues to receive improvements on a regular basis to all of its services, and that includes the built-in digital voice assistant, Cortana. Here’s a look at a couple interesting features that it can do if you need to make a tough decision at work or home. First, you use Cortana the old “flip a coin” option. Instead of asking around the office for a coin – you never have one when you need it – use Cortana. 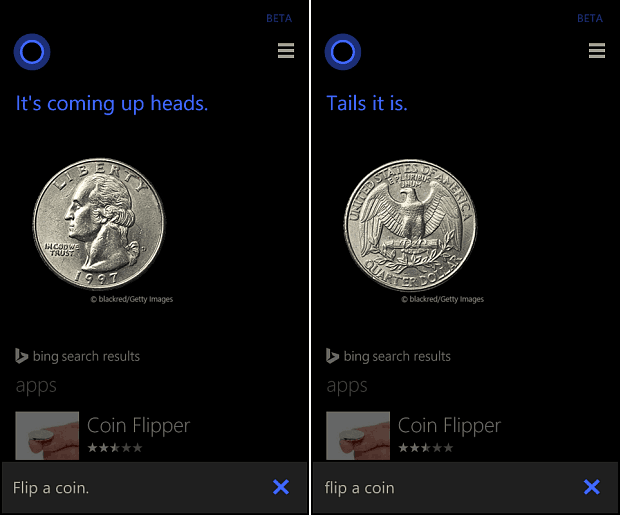 Of course you will need to pick heads or tails before asking Cortana to flip. Then just say “Flip a Coin” and she will either tell you “it’s coming up heads” or “tails it is” like in the images below. Since Microsoft has a deal with the NFL with using the Surface on the sidelines, it would be interesting to see if they could strike a deal to have Cortana do the coin flip at the games. Probably not, but could be interesting. 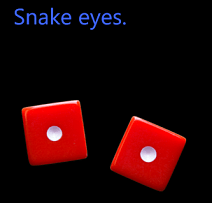 Cortana call also roll dice for you if you are the gambling type and want to make your decision with a roll of the dice. 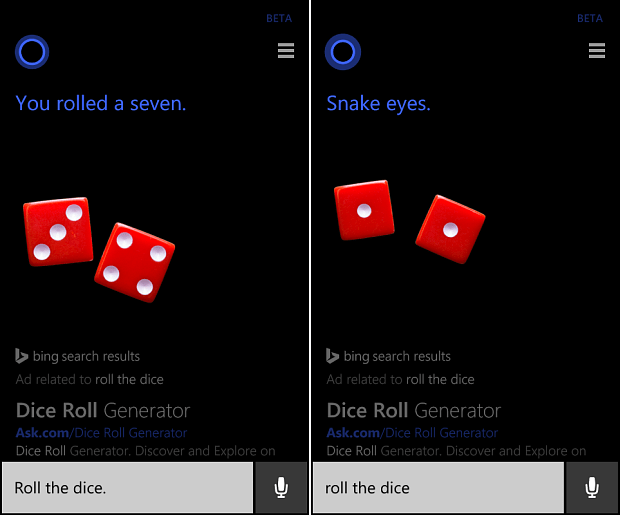 Launch Cortana and just say “roll the dice” and you will get the results similar to the ones below. There are several cool things that Cortana can do, and these are just a couple of fun ones you might not know about. What are your favorite features of Cortana or Windows Phone 8.1? Whether it’s a hidden or not – leave a comment below and tell us about it.